Looking for wedding inspirations for your wedding this Spring or Summer? Check out this post of ideas from our guestblogger Carolyn Clarke! 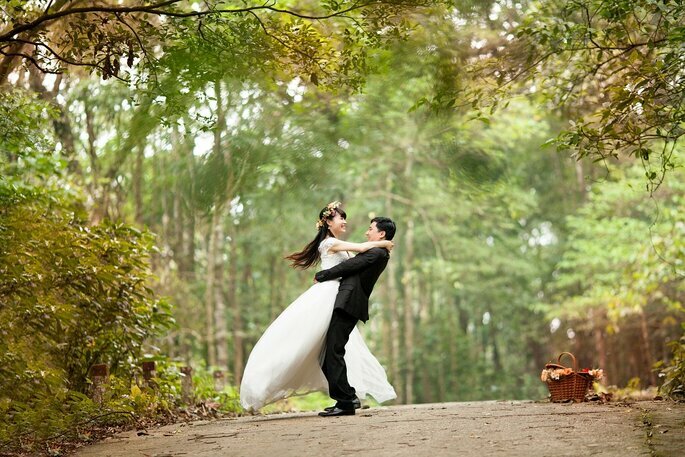 So your wedding day is on its way and you’re ready to fine-tune it to your own sensibilities. There’s an abundance of expressive and lovely wedding decoration ideas out there. If you love burlap and lace, baby’s breath, reclaimed wood, and mason jars, you are in good company. Here are a few ideas making the rounds for 2016. Using meaningful items in your decorations can contribute additional depth and significance to your reception. Your grandmother’s vintage button collection could show up dangling from tinsel off of willow twigs or small bare-branch trees. Reclaimed wood, such as an old door, laid over standing wine barrels can make a lovely and rustic table to hold pictures, your guest book, and a few welcoming treats and small gifts. Build the perfect pergola with a basic wood frame and sheer swathes of material anchored to the four corner posts. Adorn with flowers and greenery to fill in the effect. You can go further with meaningful family items placed around and inside. To create an inviting entrance to your ceremony or reception, fit a long curtain rod or dowel with two large, gauzy curtain panels and attach above the entryway of your ceremony or reception. Pull the panels to their sides and affix with flowers and ribbons in their middles to set the tone of natural elegance. Craft earthy, custom banners by cutting squares of recycled or colored paper, painting letters on, and attaching along sisal twine or jute cord. Use patterned scissors for the paper, and hang your banners on gift tables, over the cake, or even across the dance floor to wish the new couple well. Check out Paper Mart to find the color and style you want—they have cording, too. 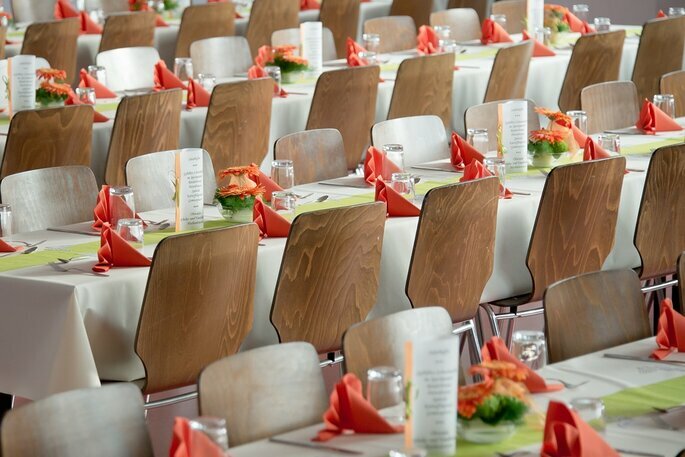 Because you will be duplicating them, table decorations are an opportunity for your creativity to really impact the atmosphere of your reception. Take those old mason jars, wrap them in burlap, overlay some lace ribbon, and fasten on a few silk flowers in white or your signature color. After you wrap the lip with twine or a twine bow, fill with baby’s breath or your favorite flowers, and you have the perfect centerpieces. Pop a few tea lights near them to add warmth. A nice twist on this is to use vintage buttons or other finds to further embellish—using them for the center of flowers can be lovely. Lanterns and small birdcages can make elegant centerpieces as well, with either a candle inside or filled with a few poseys. Have the door open and let the flowers cascade out a little for that lazy, gorgeous effect. Over your table runners and crawling among your centerpieces and other decorations, let a few vines of lazy ivy or flowering jasmine creep along to add a bit of greenery. Fern fronds placed here and there give that same soft, verdant atmosphere. You can add small gifts for your guests at place settings or all on one table as guests enter or leave. These could even include decorations for your guests. Let everyone wear flowers or put a little feather in their hair. Check out Gracious Bridal for supplies and ideas. For the bride and groom, you can use wooden letter cutouts of their initials to playfully mark their table. layers for that sumptuous look. Mark “Mr.” and “Mrs.” chairs for the bride and groom with short pieces of reclaimed wood. Paint them in fancy scroll, festoon with greenery or flowers, and hang from satin ribbons. Simple is often the best. 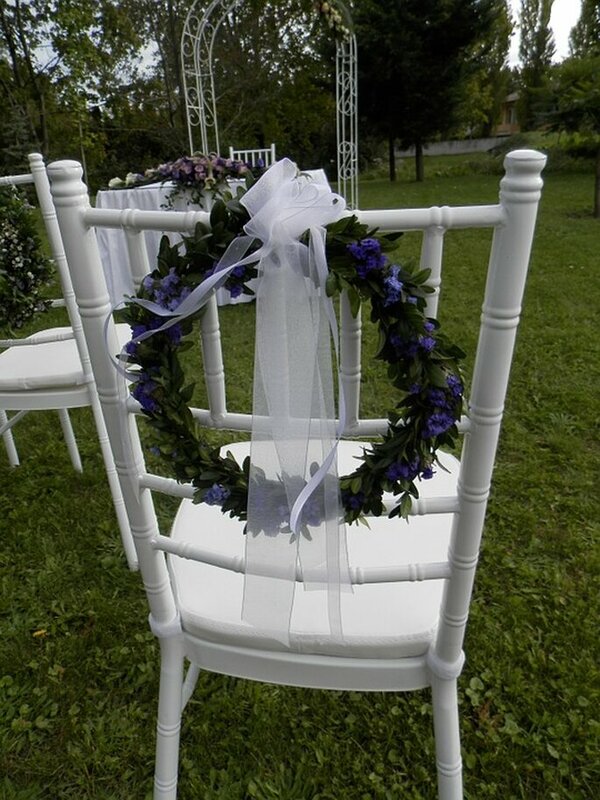 Baby’s breath and burlap ribbons can line the aisle when attached to the upper stiles or ears of the chairs along it. So grab a glass of wine and get cozy with your laptop. Perusing through Pinterest and doing a little planning and online shopping can get you the personalized wedding decorations it takes to create the atmosphere you want for your wedding day.